This article is about incidents of civil unrest, rioting, violent labor disputes, or minor insurrections or revolts in the United States. For incidents occurring before the Declaration of Independence, see List of incidents of civil unrest in Colonial North America. Wikipedia has articles on most of the major episodes of civil unrest. This list does not include the supremely numerous incidents of destruction and/or violence associated with various sporting events. 1835 – Snow Riot, Washington D.C. 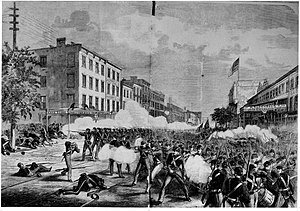 The New York Orange Riot of 1871, between Irish Catholics and Irish Protestants. 1919 – Washington race riot of 1919, July 19, Washington, D.C.
1932 – Bonus Army March, Spring/Summer 1932, Washington, D.C.
1949 – Anacostia Pool Riot, Anacostia, Washington, D.C.
1958 – Battle of Hayes Pond, January 18, Maxton, North Carolina, Armed confrontation between members of the NC Lumbee tribe and the KKK. 1968 – 1968 Washington, D.C. riots, April 4–8, Washington, D.C.
1971 – May Day protests 1971, May 3, Washington, D.C.
1991 – 1991 Washington, DC riot, Mount Pleasant riot, May 5–9, Washington, D.C.
2011 – Occupy Wall Street Oakland protests riots. October. Protesters shattered windows, set fires, and plastered buildings with graffiti. Riot police fired heavy amounts of tear gas on the protesters. 2012 – NATO 2012 Chicago Summit, May. Conflict between riot police and protesters. Dozens of demonstrators clubbed and arrested. 2014 – Bundy Standoff. April 5th - May, an armed confrontation between supporters of cattle rancher Cliven Bundy and law enforcement following a 21-year legal dispute in which the United States Bureau of Land Management (BLM) obtained court orders directing Bundy to pay over $1 million in withheld grazing fees for Bundy's use of federally-owned land adjacent to Bundy's ranch in southeastern Nevada. 2014 – Ferguson unrest, Ferguson and St. Louis, Missouri, August 10 and November 24. Following the shooting death of Michael Brown by a Ferguson police officer, protests erupt in the streets. Police respond with riot gear, tear gas, sound canons, police dogs, concussion grenades, rubber bullets, pepper balls, wooden bullets, beanbag rounds, tasers, pepper spray, and armored vehicles. Unrest occurred continuously for weeks in August, and sporadically through December, with nearly daily protests throughout the period and rioting following the non-indictment announcement on Nov 24. Unrest again occurred on the one year anniversary in August 2015, with dozens of arrests. 2014 - St. Louis, Missouri - October 8. Police vehicle windows broken as rage at the killing of Vonderrit Myers Jr. Protests continued for days afterward, during the nearby and ongoing Ferguson Unrest. 2014 – New York, New York, and Berkeley, California – After prosecutors and a grand jury refused to indict a police officer in the death of Eric Garner, protests erupted in New York City and other cities. 2014 - Berkeley, Missouri, December 23-24. Antonio Martin is shot to death by police in a St. Louis suburb nearby to Ferguson, leading to violent conflict with police, and looting. 2015 – 2015 Baltimore protests, April 25–28. Days of protests break out following the death of Freddie Gray while in police custody. 34 people are arrested and 15 Officers injured after rioting and looting break out. Gray's funeral was held on April 27 and followed by further protests and looting. Governor Hogan had preemptively activated the Maryland National Guard, while the Maryland State Police had activated at least 500 officers. 2015 - St. Louis, Missouri, August 19. Conflict with police following fatal shooting by St. Louis police officers of black teenager Mansur Ball-Bey leads to deployment of tear gas then burned car, buildings, and looting. Protests continue in subsequent days with tensions remaining high. 2016 – 2016 Donald Trump Chicago rally protest, March 11. Five people arrested and two police officers injured during a demonstration at the UIC Pavilion. 2016 – Democracy Spring rally in April. March to Washington D.C. and sit-ins lead to arrests. 2016 – 2016 Sacramento riot, June 26, A confrontation between white nationalists and left-wing counter protesters at the California State Capitol. Ten people were hospitalized for stabbing and laceration wounds. 2016 – Widespread protests erupt in response to two deaths at the hands of police, the Shooting of Alton Sterling and shooting of Philando Castile. At least 261 people were arrested in protests in New York City, Chicago, St. Paul, Baton Rouge, and other cities. 2016 – 2016 Milwaukee riots, Sherman Park, August 13–15. Milwaukee, Wisconsin. 2016 – 2016 Charlotte riot, September 20–21, Protests and riots break out in response to the shooting of Keith Lamont Scott by a Charlotte police officer. 2016 – Dakota Access Pipeline protests, 411 protesters arrested. Multiple skirmishes with police, with vehicles, hay bales, and tires set on fire. 2016 – Anti-Trump protests, Nov. 9-27. As a result of Donald Trump elected as 45th President of the U.S., thousands protested across twenty-five American cities, and unrest broke out in downtown Oakland, California, and Portland, Oregon. In Oakland, over 40 fires started and police officers were injured. 2016 Portland, Oregon riots, Nov. 10-12, Protests leading to riots broke out in reaction to Trump's election. 113 arrested. 2017 – Anti-Trump protests at the inauguration in Washington, D.C., January 20. Objects were thrown at police, businesses damaged, and a limousine was set on fire. More than 230 were arrested. During a kettling mass arrest operation, police injured nonviolent protesters who were engaged in a march that was a significant distance in location and time from the aforementioned incidents. 2017 – Berkeley, California, February 1, civil unrest ensued at UC Berkeley as Milo Yiannopoulos was scheduled to speak on the campus. 2017 – 2017 Anaheim, California protests, February 21, protesters demonstrate after police officer grabs boy and fires his gun. Protesters damage property and throw bottles and rocks at police. 2017 – Berkeley, California, March 4, Brawls erupt when Trump supporters and counter-protestors were attacked at the March 4 Trump rally. 2017 – Berkeley, California, 2017 Berkeley protests become violent when Trump supporters and protestors clashed at "Patriot's Day" rally for Trump. 2017 – May Day, violence breaks out at May Day protests in Olympia, and Portland, as masked anarchists damage property and clash with police. 2017 – 2017 Unite the Right rally, Charlottesville, Virginia, August 11–12. At a Unite the Right rally of white nationalists and white supremacists opposing the removal of a statue of Robert E. Lee, rally attendees and counter-protesters clashed, sometimes violently. A woman, Heather Heyer, was killed and 19 other injured when a rally attendee drove his car into a crowd of counter-protestors. Two law enforcement officers also died in a helicopter crash while monitoring the event. 2017 – 2017 St. Louis protests, beginning September 15, large protests erupted when police officer Jason Stockley was found not guilty of murder in the shooting death of Anthony Lamar Smith on December 20, 2011. Some of the protests turned destructive and the police became violent. Windows were broken at Mayor Lyda Krewson's house and in the Central West End business district on the first night, many windows were broken in the Delmar Loop on Sept 16, a few were broken downtown on Sept 17 after police drove swiftly through a crowd following a peaceful march. Police conducted a kettling mass arrest operation of nonviolent protesters and bystanders, beating and pepper spraying many, including journalists, documentary filmmakers, and an undercover officer. Protests and sporadic unrest continued daily for weeks. 2018 – Patriot Prayer, Portland Police declare riot as members of alt right Patriot Prayer group clash with left wing antifa in downtown Portland on June 30th 2018. Over 9 people arrested. List of race riots – see U.S. section. ^ see Ronald Gottesman, and Richard Maxwell Brown, eds. Violence in America: an encyclopedia (1999). ^ "Milo Yiannopoulos talk at UC Berkeley cancelled after protests erupt". KTVU. ^ "Riot Forces Cancellation Of Yiannopoulos Talk At UC Berkeley". KPIX 5. ^ "Pro-Trump rally in Berkeley turns violent as protesters clash with the president's supporters". Washington Post. Retrieved 2017-08-22. ^ John, Paige St (2017-04-15). "21 arrested as hundreds of Trump supporters and counter-protesters clash at Berkeley rally". Los Angeles Times. ISSN 0458-3035. Retrieved 2017-08-22. Gottesman, Ronald, and Richard Maxwell Brown, eds. Violence in America: an encyclopedia (1999). Graham, Hugh Davis, and Ted Robert Gurr, eds. Violence in America: Historical and comparative perspectives (1969). Gurr, Ted Robert, ed. Violence in America: Protest, rebellion, reform (1979). Hofstadter, Richard, and Michael Wallace, eds. American violence: A documentary history (1971).